Detlev Schlichter is an independent economist, market commentator and investment strategist. Detlev had a 19-year career in international financial markets as a trader and portfolio manager, including stints at J. P. Morgan, Merrill Lynch, and Western Asset Management. 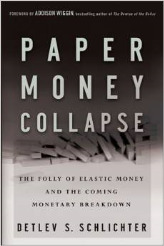 In 2011 he published his first book Paper Money Collapse – The Folly of Elastic Money (John Wiley & Sons), which won the get Abstract International Book Award in 2012, and which is now in its second edition. With German influence on the ECB waning, trashing your currency becomes official strategy more easily, and this is already official policy in Japan and in the US. The data was not really surprising and neither was the response from the commentariat. After a run of weak reports from Germany over recent months, last week’s release of GDP data for the eurozone confirmed that the economy had been flatlining in the second quarter. Bitcoin as a monetary concept is potentially a work of genius, and even if Bitcoin were to fail in its present incarnation – a scenario that I cannot exclude but that I consider exceedingly unlikely – the concept itself is too powerful to be ignored or even suppressed in the long run. Investors and speculators face some profound challenges today, such as how to deal with politicized markets that are continuously “guided” by central bankers and regulators. After months of whining and whining by the international commentariat, and of relentlessly redefining what any sensible person would call “price stability” as a grave economic problem, the ECB has caved in, as expected, and yesterday announced further stimulus measures. 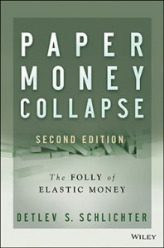 Description: Paper Money Collapse: The Folly of Elastic Money, Second Edition challenges the mainstream consensus on money and monetary policy. While it is today generally believed that the transition from 'hard' and inflexible commodity money (such as a gold standard) to entirely flexible and potentially unlimited fiat money under national central banks allows for superior economic stability, Paper Money Collapse shows that the opposite is true. Description: In 2011 he published his first book Paper Money Collapse – The Folly of Elastic Money (John Wiley & Sons), which won the get Abstract International Book Award in 2012.